This truly is a unique tool for making spectacular fire shows. The effect from this amount of fire is awesome! It is ideal for stage shows. 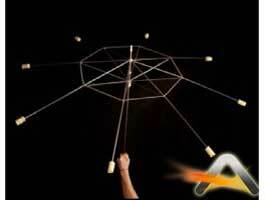 As it is not technically demanding to use, this prop is ideally suited to non juggling/manipulation based performers. Although this is the best umbrella we've found it does need careful handling and storage! If you treat it with care it will last well. Always keep it open when lit and don't close until the fire is completely extinguished.